As new complete in factory double boxes, manual in 9/10 condition. The nicest phono section I know of anywhere near this price but call me about the JC-3Jr or new improved JC-3+ ? One owner trade in on the Parasound JC-3+. 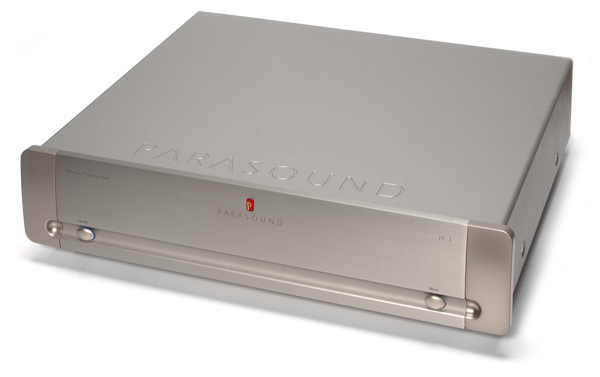 We are a Parasound dealer & are interested in most trade in's like the first version JC-3 on virtually anything or a new JC-3+. If you have a JC-3 and interested in up grading to the JC-3+ and or have any Audio questions, call David @ 310-9027-2260 West Coast Time 10AM - 10PM. 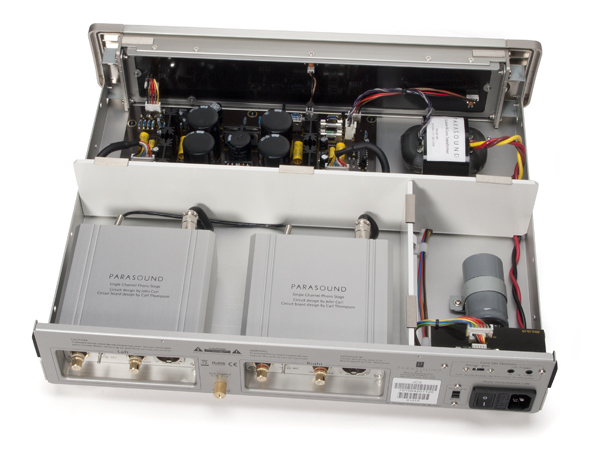 It is best to call me as we are a Parasound dealer and can go over all of your BEST options in Parasound Products. 90s; it’s like that vintage sports car you always wish you still had. 3, doesn’t cost as much as it might if it were, say, a boutique product. you might expect and takes up a full shelf on an audio rack. the door, it seemed pretty wacky to spend almost $2,000 on a phonostage. more than a few mono records in their collection. modules significantly contribute to the final result. for a spectacular sonic marriage. 501II mounted on an SME 309 arm, and fitted to the AVID Diva II SP. the JC 3’s speed and low noise. instruments well separated and sounding as they should. in Run-D.M.C.’s “Can You Rock it Like This” from King of Rock showed off more grunt than the two tube preamps could muster, offering up the kind of bass I actually felt through the JC 3. Shunyata Python CX) and being plugged into the Running Springs Dmitri. power line conditioner, don’t hesitate to plug the JC 3 into it. superlative DAC for the price. The JC 3 takes a similar approach. of course, may be different. you choose for your linestage. a megabucks analog front end. for 2011. Priced under $2,500, the unit is nothing short of a miracle. Weinhart Design has lots of other items new and used and if you’re in Los Angeles or visiting please accept my invitation to experience our World Class Audio Showroom (BY APPOINTMENT). 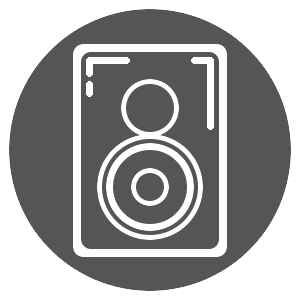 We are always interested in purchasing quality Audio and Video items, ESTATES & LP collections and most quality trades are welcome. All sales out of California are California State Sales Tax exempt. California 9.5% State Sales Tax applies only for items picked up or shipped to a California address. 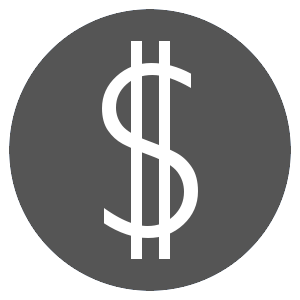 We accept payments by Bank Wire Transfers without fees and is the only form of payment on all sales out of the U.S. and Canada. We prefer this method of payment, which also makes shipping to addresses other than billing agreeable. VISA, MasterCard and Paypal are gladly accepted within the U.S. and Canada as long as the charge is approved and shipping to the billing address on record and adds 3% to cover costs. Please call me directly in my world class showroom in Los Angeles weekdays 11-4PM @ 310-472-8880 or on my cell including weekends from 10-10PM @ 310-927-2260 and I can answer your questions and help you with all of your new and pre owned needs. Good evening. I am looking at your JC3. I am using a Ortofon Quintet Black that recommends >27ohm load. Do you know how that squares with the 47 and 100 options on the JC3? Thank you. Hi there. The ad says it's JC3, but then down in the ad it says one-owner trade-in on JC3+, so just want to know if it's the + for sale.